A big hit with county listers and local residents, this small city park is a good stop for travelers in search of a quick morning or evening of birding in a friendly small town setting. 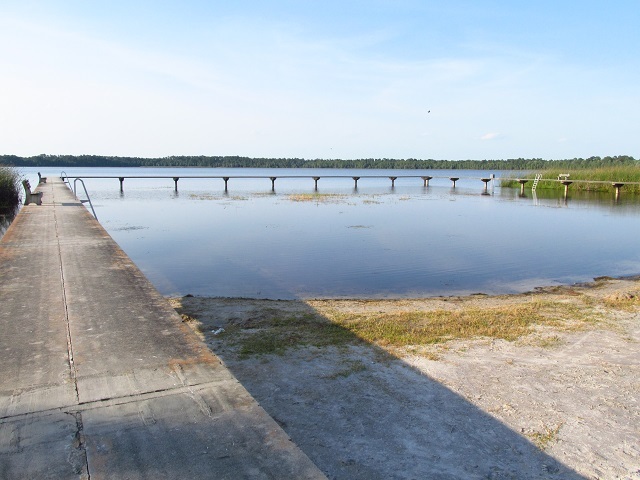 The park abuts Lake Butler, a 350-acre, unspoiled lake. One of the park’s best features is a concrete U-shaped pier that juts out into the lake; this makes a great platform to set up a spotting scope or to simply scan the lake with binoculars. Another good observation point is the fishing pier/boat dock to the west. Scan for American Wigeon, Canvasback, Redhead, Bufflehead, and Ruddy Duck; in 2009 a pair of White-winged Scoters were found, an incredible inland record for this northern sea duck. Other coastal birds like Common Loon and Horned Grebe have been spotted in the winter as well, proving that anything is possible at this site. Gulls and terns will stop here during migration and early morning birders may be rewarded with the odd shorebird species resting on the beach. Keep your eyes on the skies and you may spot flocks of Swallow-tailed Kite, Purple Martin, Barn Swallow and Chimney Swift overhead, and perhaps a Bald Eagle or two during autumn.